There are several major benefits to using cellular or Wifi. First of all we need to have a discussion about costs. The cellular contracts can be downright predatory when it comes to data fees. I recall once I was oversees and I had barely gotten to my hotel when I got a phone call from my provider warning me that I had already wracked up close to a $1,000 bill. How on earth? Without realizing it, my phone had been phoning home to connect to all sorts of digital services and in just over an hour – the time it took me to drive to my hotel, my phone had gotten me into hot water. Thankfully I have one of those special enterprise level accounts and they forgave it and switched my plan to an international roaming plan. But this points to a bigger issue. Why pay for the base band – or why pay more than you have to? 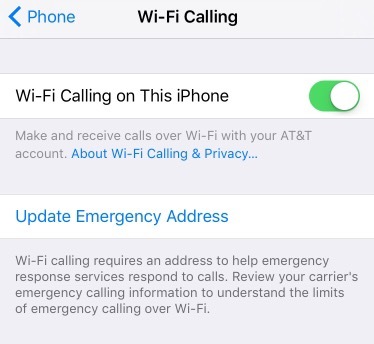 If you take a look at modern phones they generally have a setting to change to use Wifi calling. Wifi calling is basically the same thing as Femtocells, only they are allocated to your existing Wifi connection. The cost is the same as whatever normal plan you have, yet it all goes over Wifi instead of through a GSM tower or whatever tower is nearby. Wifi also can provide data services. So keep in mind, modern cell phones are effectively VOIP anyway. So if you combine your phone with Skype and Wifi, or Facetime and Wifi or any other VOIP service, you now have a way to communicate that gets around the baseband of AT&T, or Sprint or Verizon or whatever. I don’t think they realize it, but the public has no love lost if those carriers go away, but for now they still provide a service. Many mobile providers are beginning to hijack NXDOMAIN DNS responses and ad networks to inject their own ads. Their distaste for net neutrality, bandwidth throttling, predatory billing and terrible customer service have put them in a position where users are eager to find alternatives. Wifi might just be that silver bullet. Companies like Google are trying to put Wifi across entire cities – so that anyone using their Wifi service will suddenly be able to route their VOIP calls and data without using cellular data services. The problems arise in the fact that eventually you end up with a very similar problem over again. The data providers like Comcast, Google Fiber, and AT&T aren’t exactly better and in some cases are the same exact companies. Eventually everything will be tunneled over some form of encryption which is good for advertisers like Google who lose big time when other companies do ad-injection, which is why they want to own Wifi and local connectivity. As someone who is on the road a lot, I’m left with a few options. From a security perspective there isn’t a lot of difference. The local coffeeshop may be monitoring the wire, but most of my traffic is encrypted. They may be doing ad injection but again, I’m encrypted. They’re infinitely cheaper than using data, so that’s a big plus for most people. GSM has the advantage of being more cost prohibitive to spoof and therefore less likely to be faked by an adversary. They do ad injection often, and monitor the connection, but again, I try to do everything over an encrypted connection. So it really comes down to cost. Pure and simple. Wifi + encryption is definitely the way to go.